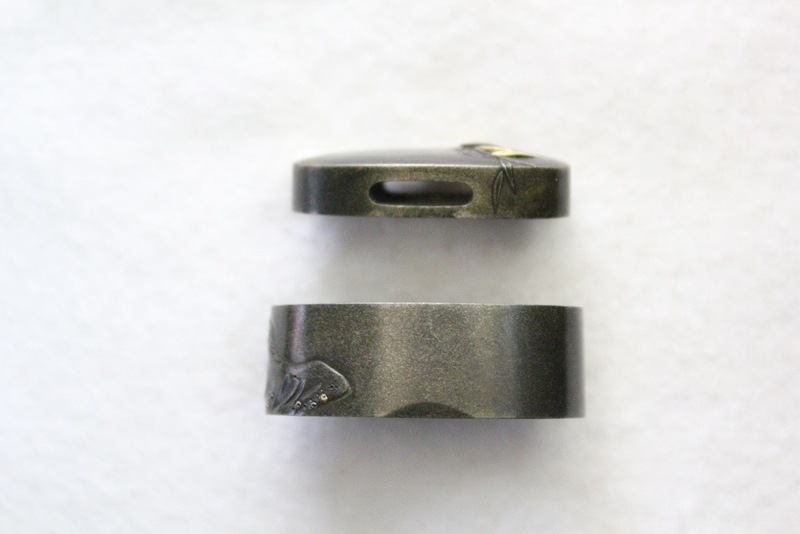 The base plate is made of Shibuichi which is an alloy of one part silver to three parts copper which turns dark grey or brown. 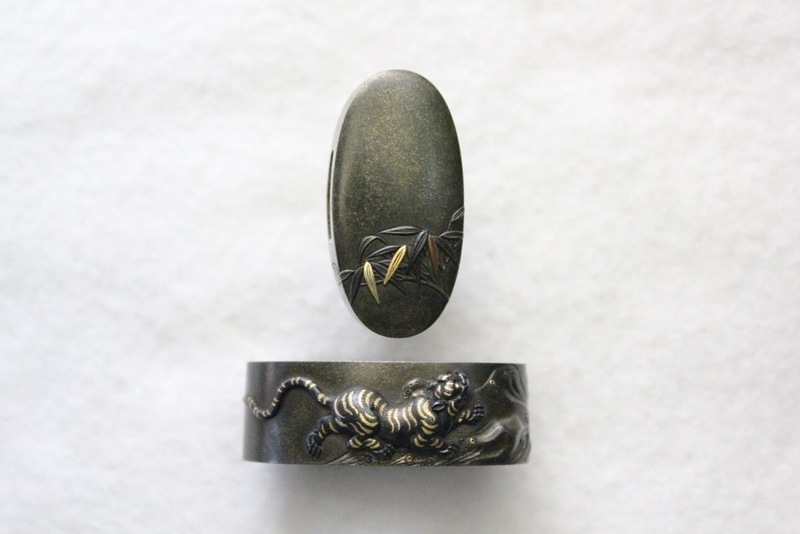 The tiger on the fuchi is rendered in high relief shakudo and gold inlay for the eyes and stripes. 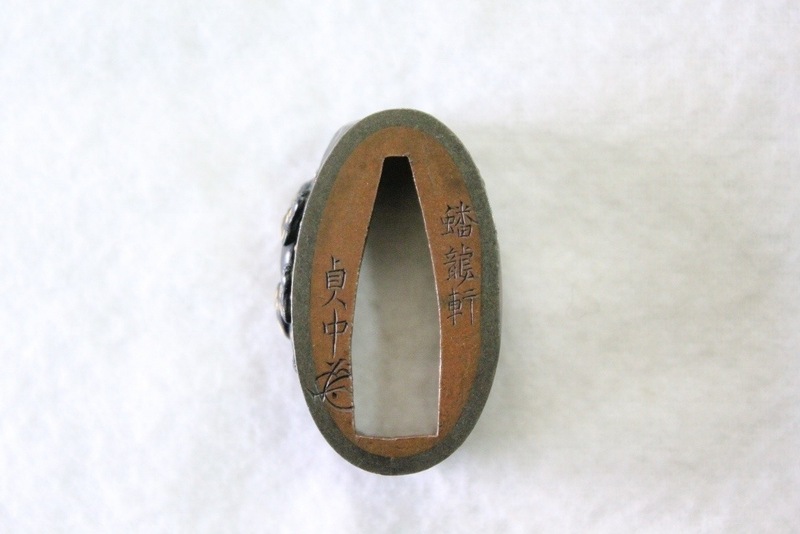 The leaves on the kashira are done in shakudo with gold and copper iroe. Signed Banryuken Sadanaka with Kao. Ichinomiya school. Mid Edo period. Ichinomiya Nagatsune (1722-1786) founder of the school is looked upon as one of the finest chasers in all of Japan. Born in kyoto from a family who had migrated first from Kaga to Echizen, then to the old Capital. He was apprenticed to a metal gilder to the Goto but started making sword furniture himself under the name Sessan, using Kano designs. In Meiwa period he received the title Echizen no Daijo from the Kyoto court and he made a cover for a Shuro (silver brazier) sent to the Korean King who offered it to the Chinese Emperor Ch’ien Lung. 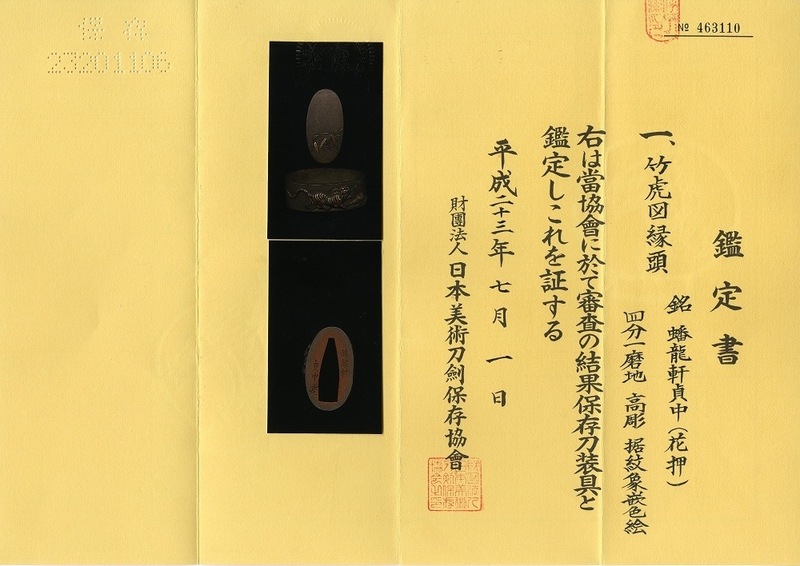 Nagatsune was an accomplished painter (taught by the famous Shijo painter Maruyama Okyo), which no doubt helped in his design of sword furniture. He was also awarded the prestigous title of Echizen no Kami towards the end of his career. Tigers were largely unknown in Japan except for paintings and skins. The story of the tiger and the bamboo grove was a popular design element in Kano school paintings of the Momoyama and Edo periods. An ancient Japanese proverb says that the strong must protect the weak and, in exchange, the weak must serve the strong – the tiger keeps predators at bay from the bamboo, which in turn conceal him in a lair of protection.